The first High School Baseball Network All-American Weekend kicks off tonight with what shapes up to be a thrilling home run derby presented by the POWER SHOWCASE World Classic. Prior to participating in workouts and games later on this weekend, a collection of 18 talented sluggers will compete in the prestigious derby. Over the past eleven years the POWER SHOWCASE has evolved to provide one of the best amateur baseball experiences around, allowing ball players from all ages to showcase their tools and talents. 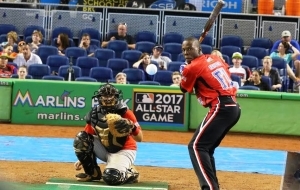 The POWER SHOWCASE World Classic is an elite competition in a Major League stadium at Miami Marlins Park in front of an international audience. It is a terrific vehicle for player’s careers that creates positive lasting memories for everyone involved. Current professional stars like Bryce Harper, Kris Bryant and Anthony Rizzo have previously taken part in the POWER SHOWCASE. Friday’s derby serves as a mini-showcase that will also bring out the voice of HSBN, Luis Perez announcing and running the scoreboard just as he will for the events all weekend long. Participants will hit off a two-wheeled jugs pitching machine in an open-bat format, which means the old BESR bats are allowed. POWER SHOWCASE founder and President Brian Domenico will feed the machine baseballs all night, as he typically does at the showcases each year. Each player will receive 13 outs in the preliminary round, with the top three moving on to the finals. The finalists will receive 10 outs each. 2015 World Champion Justin Farmer swings away in the derby championship round. Tonight, there will be five award certificates handed out for longest home run, consecutive home runs, most homers hit during preliminary round, and overall home run total. The overall winner of Friday’s derby gets an automatic invitation to the 11th annual POWER SHOWCASE World Classic at Marlins Park from December 27-30th. For those who were not able to secure their spot in the HSBN Derby tonight, or do not win, all is not lost. There are still a few spots available in the Babe Ruth Classic game for players in the 2019-2020 classes. If interested contact Brian Domenico at (561) 271-7247 or powershowcase@att.net. Tonight, players will arrive early throughout the evening tonight for welcome dinners and meetings with their coaches, as the first step in the schedule of weekend events. The weekend will then ramp up the energy and excitement heading into Saturday’s workouts and Sunday’s games. Leading the group of contenders is Royal Palm Beach senior Tarik Latchmansingh, whose 13 career high school home runs leads the field of contenders. Latchmansingh has also previously participated in several POWER SHOWCASE events and has experience hitting off the pitching machine. West Boca’s Alex Cordero and McArthur’s Jack Bermudez have also shown strong power numbers in their high school careers and could threaten for the title. Yet nothing is guaranteed and anything is possible for the hitters who swing away aiming for the fences at Paul Demie Mainieri Field at St. Thomas University.